Nov 10th. On their first visit to the club Moirai. 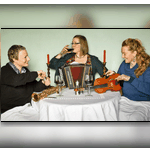 On their first visit to the club Moirai brings together the talents of Jo Freya, Sarah Matthews and Melanie Biggs playing a variety of instruments coupled with three strong voices. Expect traditional tunes and songs in harmony and solo along with self-penned numbers, all delivered with great humour. Each of them could hold the night on their own together they are sensational.